Why are Emergency Numbers important? In an emergency every second counts. The quicker emergency crews can find a home, the faster we can provide help. Reflective house numbers, placed in the right place, are critical for first responders. Whidbey Island house numbers are difficult to locate on dark rainy nights, or when the power is out. Why are you doing this project and who is paying for it? Because we care about your safety, we applied and were awarded a FEMA Assistance to Firefighters Grant to provide every physical address on South Whidbey a reflective emergency numbers (address) sign. 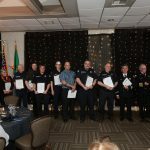 We also were awarded smoke detectors, carbon monoxide detectors, and replacement batteries. This project was 95% funded through a 2008 U.S. Department of Homeland Security FEMA Assistance to Firefighters Fire Prevention Grant. 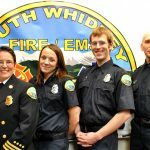 South Whidbey Fire/EMS provided 5% in matching funds to this grant process. How much does it cost me to receive my sign or smoke detector, or batteries? There is no charge to South Whidbey residents. The sign and installation are free. The replacement batteries will be given to those individuals who qualify, also free of charge by visiting their neighborhood fire station the first Tuesday evening of the month from 7:00 – 8:00 PM. We have ran out of the carbon monoxide detectors from the 2008 grant. What do I need to do to get my Emergency Numbers sign? You don’t need to do anything, unless your driveway is accessed via a private road (see next question). We will install your sign in the county right-of-way for you free of charge as time permits. 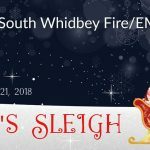 If you would prefer it to be located on your property or structure, you must sign and submit this consent form (link to form) and take to your local station or mail to South Whidbey Fire/EMS, 5535 Cameron Road, Freeland, WA 98249. Please do not delay to submit the signed form. We will contact you to locate it where you want the sign after you submit the form. What do I need to do to get my Emergency Numbers sign if I live on a private drive/road? 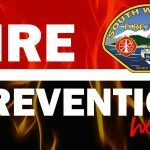 Very simple, contact us at any fire station, address@swfe.org, 360-321-1533, or click the link below to get your consent form (link to form). You must sign and submit this and take to your local station or mail to South Whidbey Fire/EMS, 5535 Cameron Road, Freeland, WA 98249. Please do not delay to submit the signed form. We will contact you to locate it where you want the sign after you submit the form. When will you install my Emergency Numbers sign? We are working our way around the south end of Whidbey Island in the neighborhoods that we serve on county right-of-way areas first. The grant funded employee portion has ended, however the Board has continued the funding of a full time Sign Technician with budget funds. 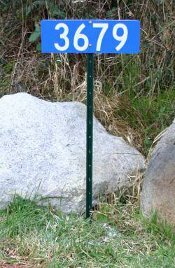 Either the Sign Technician or fire station members, will install many house numbers on a metal post in the county right-of-way adjacent to your driveway if you are in our target areas. If you prefer, we can mount the numbers on the side of your home (which we preferred) if it is clearly visible and less than 100 feet from the road after you submit a consent form (link to form). Will you just show up at my house or will you contact me first? Do I need to be home when you install the Emergency Numbers sign? No. Unless we receive a consent form (link to form) we will put the sign in the right-of-way on a lightweight metal post we provide. We will try to make contact with you if the sign is to be installed anywhere else or as you specify. Remember, it you are on a private road or drive, we will need your consent. How big are the Emergency Numbers signs? Can I choose my color? The signs are 6 inches tall by 18 inches wide with 5 inch tall white reflective number on a blue background with a light weight green metal post (unless mounted on something you specify, i.e. fence, house, or other object). The numbers are horizontal only. Island County currently requires 4 inch tall house numbers on contrasting colors currently, these are just an enhancement to the county ordinance to help emergency responders. These signs meet and exceed the County’s requirements. Can I install my own Emergency Numbers sign? Not presently. This is one way we can ensure they are mounted consistently and where they need to be for our responding emergency crews to quickly find your home. We will also contact your local utility company TWO business days prior to installing the sign to be sure any buried utilities are located as required by state and federal law (National One Call). It also ensures that our records systems and 911 map has your address listed correctly. We are currently experiencing a 20-70% error or discrepancies in the address on the south end and have to order many signs. What if I don’t want an Emergency Numbers sign? Can I refuse to have this done? Yes you can, but we don’t recommend it as we have pre-ordered most addresses to allow us to find you during your emergency. These numbers are critical for helping first responders find your home especially with the high numbers of inaccuracies in address that we are discovering. If you still do not want your sign, it will not go to waste. We return unwanted or incorrect signs on our next order to create missed or new address. This does mean that if you change your mind later, there will likely be a charge for a new sign to be made. Why did my neighbor get an Emergency Numbers sign and I did not? 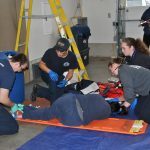 It is possible that they requested one via the consent form (link to form) or are a member or are a member of South Whidbey Fire/EMS. The other possibility is that our 911 map record was not correct and your address was not listed when we made the order in 2008 or we had the wrong address shown. If we determine it was missed and a post was installed, we probably have your sign on our order form. To be safe, please complete a consent form (link to form) to make sure yours is ordered. We will notify you if your address is missing in our database and that it was ordered via email if a consent form is filled out. Why did you only install a green post and no Emergency Numbers sign? It is most likely that our 911 map record was not correct and your address was not listed when we made the order or we had the wrong address shown and did not have an address number to install. As required by state and federal law we must do a utility locate request two business days prior and will request the entire road/area at one time. In an attempt to reduce the number of locate requests, we will install a post when request is cleared by the utilities who serve you and order the sign to install at a later date. To be sure, please complete a consent form (link to form) so that we can email you and to make sure yours is ordered. What if the Emergency Numbers sign posted is different than my address? Please let us know at address@swfe.org or 360-321-1533 and we will promptly look into the discrepancy. It may be as simple as human error and we put your neighbors up instead of yours or our 911 map records may be incorrect. We will ensure you have the correct address posted when we are done and work with the County and Dispatch to get our 911 map corrected if that was the error. Will my address change with this program? Your address number is out of sequence (example your neighbor is 4122 to the left and 4134 to the right and you are 4136). Your address number is an even (or odd) on the wrong side of the road (example, your neighbors to the right and left are 4122 and 4134 and you are 4131). Your address number was previously assigned when your driveway was off of road X and now is accessed of road Y. The county addressing is grid based and roads going East and West are one address range and North and South are another.